The large Green-winged Macaw is one of the sweetest tempered of all the large Macaws! The Green-winged Macaw Ara chloroptera is one of the largest of the Macaw parrots. It is quite beautiful in color and very distinguished its own right. It is considered to be one of the most docile Macaws and often referred to as the 'gentle giant'. This pet bird it is appreciated for both its coloration and its temperament. It tends to be gentler, quieter, and a more affectionate Macaw than many of its relatives, making it a superb companion and family pet. This large Macaw has been kept in captivity as far back as the 17th century. In these early times there was not a lot of emphasis placed on breeding. As with most parrots at that time, the Green-winged Macaws were usually kept singly and it was not possible to determine their gender visually. Breeding parrots began in more earnest around the turn of the 19th century and breeding the Green Wing was highly successful. Today this large Macaw is well established in aviculture and readily available as a pet. The Green Wing is colored in a rich, deep red from its head down through the upper mantle of the back and wings, the underparts, and the tail. Below the red, running across the middle of its back and wings, is a band of green and thus its common name "Green-winged". The green then yields to a light blue on its rump, the upper and lower tail coverts, and tip of the tail, and to a dark blue on the wings. It is second in size only to the Hyacinth Macaw Anodorhynchus hyacinthinus which is the largest Macaw and is itself the second largest parrot in the world. Both of these Macaws are big birds. The Green Wing averages a length of about 35 1/2" (90 cm), compared to the Hyacinth at 37" (95 cm), and a weight of about 2.7 pounds (1.2 kg) compared to about 3.7 lb (1.7 kg). The naming of this bird has a rather twisted history, its been called a variety of names that reflect both its size and color. Both this Macaw and the Hyacinth Macaw have been referred to as a 'gentle giant' because of their large size yet very pleasant personalities. In color, this bird is often confused with the Scarlet Macaw Ara macao because of the large amount of red in its feathering. However the Scarlet has a broad band of yellow feathers across the back rather than green ones like this bird has. Common names were flurried about to depict this bird as well as its red cousin with the yellow band of feathers. This Macaw was referred to as the Green-winged Macaw, Green Wing Macaw, Red and Green Macaw, Red and Blue Macaw, Crimson Macaw, and Maroon Macaw. At the same time names to depict the smaller Macaw with the yellow band ranged from Red Macaw, Red and Gold Macaw, Red and Yellow Macaw, Red, Yellow and Blue Macaw, and Scarlet Macaw. It was in 1949, when a Dr. Osmond Hill, after careful researched of all available materials on these species, suggested that everything be simplified. He suggested that Ara macao simply be called the "Scarlet Macaw", and Ara chloroptera simply be called the "Green-winged Macaw". And these are the two common names primarily used for each of these Macaw species today. Despite its overall red appearance, the personality Green-winged Macaws is just about the opposite of the Scarlet Macaw. The Green-winged Macaws are very sweet tempered birds that are affectionate, inquisitive, and intelligent. They make them a great companion not only for a single person, but when well socialized, they are friendly with everyone, even other birds. This is quite the opposite of the brilliant red Scarlet, which can be quite a fiery bird and needs a firm hand. Distribution The Green-winged Macaw Ara chloroptera was first described by Gray in 1859. Its natural habitat runs from eastern Panama in Central America south across northern South America, east of the Andes to Bolivia, Brazil and Paraguay, with a rare occurrence in northern Argentina. It is found living in tropical rainforests along lowlands and the lower foothills of interior regions rather than in coastal zones. It lives in pairs or small groups rather than flocks. A true forest bird, it spends it day feeding in the treetops. Its food consists of seed, nuts, fruits, and green vegetation. Status The Green-winged Macaw Ara chloroptera is on the IUCN Red List for Endangered Species as Least Concern (LC). Description Green-winged Macaws are very colorful parrots. The head, shoulders, and breast are a rich deep red. There is a greenish band below the shoulders and wings, yielding to a dark blue on the wing, and a light blue on the rump and the upper and lower tail coverts. It has very long tapering red tail feathers that are tipped in blue as well. Its legs are dark gray and the iris of the eye is yellow. The upper beak is horn colored with a dark gray on the lower sides, and the lower beak is also a dark gray. Green-winged Macaws are a full sized Macaws. They have an average length of about 35 1/2" (90 cm), and a weight of up to about 2.7 pounds (1.2 kg), and a lifespan of up to 60 years. A younger bird will be similar to the adult in color, but with a shorter tail. The lower part of its beak is a be paler gray and they have a brown iris. The Greenwing differs in appearance from the similar Scarlet Macaw by the band of green feathers across its back. On the Scarlet there will be a broad band of yellow feathers across the back. 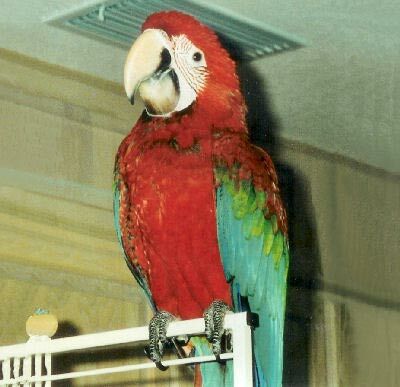 "Banjo", seen in the picture to the right, is a surgically sexed Green-winged Macaw. He is a male, and after sexing, a tattoo was placed under his wing as a record. Care and FeedingIn the wild the Green Wing Macaw eats a variety of seeds, nuts, fruits, and vegetation in the treetops. There are name brand commercially prepared seed or pellet mixes for the Macaw. They can also eat anything nutritious that you eat and these foods should be offered. Most parrots enjoy eating with their family. They eat some protein in the wild and they do like chicken. Avocado and chocolate are toxic to parrots. HousingLarge Macaws require a roomy cage, at least 2 1/2 by 3 feet. The Green Wing Macaw is quieter than other large Macaws, but it is a still a good idea to place the cage is in a room where the amount of noise the neighbors hear is a minimal as possible. A large sturdy perch needs to be mounted in the cage. Fresh fruit tree branches work great because they can chew on them as well, but then they will have to be replaced occasionally. Food and water dishes, along with a treat dish work best mounted above the perch at the side of the cage. A variety of toys for playing and chewing should also be provided. As alternatives to a cage, they can be kept in an outdoor aviary where the weather permits, and some people like to provide their bird with its own "bird room". Social Behaviors Green-winged Macaws are lovable, friendly, and intelligent. Macaws can be quite loud, being especially loud when anticipating interaction with you. They will also mirror your moods, so if you are agitated, they can become agitated. If you are happy and loving, well so is your pet. Handling/Training The Green Wing Macaw is intelligent and eager for attention and play. It has a good disposition and responds well to handling and training. This Macaw adapts quickly. Once it becomes accustomed to a new environment and its keeper it is then ready to start bird training. Generally though, you should give a new arrival a few days to get use to you, your voice and its cage before trying to handle it. A hand fed baby will not need much taming and can often be handled right away, as it is use to human attention. Sexing - Sexual DifferencesNo visible differences. There is no for certain way to distinguish a male Green Wing Macaw from a female. In order to know whether you have a male or female, the bird must be sexed. DNA / Feather or surgical sexing is recommended. Breeding/Reproduction The Green-winged Macaw is well established in aviculture, especially in the United States, and is commonly bred in captivity. The usual clutch consists of two or three eggs which incubate for about 28 days. The babies will fledge after about 3 months in the nest. Feed the parents additional high-fat seeds, like sunflower seed, during the breeding season. Also feed the parents plenty of green stuffs, corn-on-the-cob, carrots, protein, and fruit laced with food supplement while they are rearing the youngsters. The Green-winged Macaw has also been crossed with other large macaw species to develop a number of hybrid Macaws. These include first generation (F1) hybrids like the Buffwing Macaw, Calico Macaw, Harlequin Macaw, and Ruby Macaw, and second generation (F2) and later generations hybirds such as the Cameo Macaw, Flame Macaw, and Jubilee Macaw. It has not been hybridized with Mini Macaws. If you notice any of these bird illnesses in your Greenwing Macaw immediately provide a warm, draft free, secure environment kept at about 86°F (30°C). Place food and water close to the perch where it is easily accessible. An ailing parrot should be taken to an avian veterinarian for diagnosis and treatment. Availability: The Green-winged Macaw is fairly common, moderately priced, and generally available. It is easy to find a Green-winged Macaw for sale. Ok, two macaws , 3 y/o , NEVER leave their cage, have no toys, they never see anyone but for a minute or two when they are being fed, and that is all; their cage is incredibly filthy, surrounded by flies, and smelly, covered in feces; they have never had a shower and the two of them are incredibly healthy! how you explain?? So hello, I'm new too this. And I'm selling my Pet 'baby' zebra!! 205$? best pricing. Well! my wife and I have just ordered our first Green winged macaw and should get it in about 2-3 months time and we are both very excited. I used to keep Blue and Golds some years ago but my experience has dwindled over the years. The more i read and try to find out about the Green wing, the more confused i become. Some articles say that Green wings are not good talkers, and become aggressive and dominant, other people have written that their G/W is a brilliant talker(30 words +) small sentences, sings and dances and is so sweet and cuddly to all the family and don't believe anyone who says there not! I know this is probably down to training and constant socialization. I was advised to read a certain book on parrot training by the breeder, who says the book is a great help, but the author says you should immediately trim the feathers as soon as you get the bird to avoid injury and also that its impossible to start to train the bird without doing so, but the breeder says NO! You must wait at least a year before trimming. So! any comments on all the above or helpful suggestions or tips on living with a Green wing and making it part of the family and hopefully not just a one person bird from experienced owners would be very welcome. I had my gw for almost 20 yrs. I had never trimmed his wings. I had no problems with him. He has his own room with plenty of space. The issue is I'm getting older and my birds are not, I need to decide how to handle this situation. v They all need a loving and caring home. I'd love to buy your bird? Even though it isn't for sale. I'd still love to buy it! 10,000?